While Events Calendar Pro provides some calendar widgets that you can add to your site's sidebars and such, sometimes you don't want the calendar content in a sidebar—you want it squarely in the content of a post or page directly. 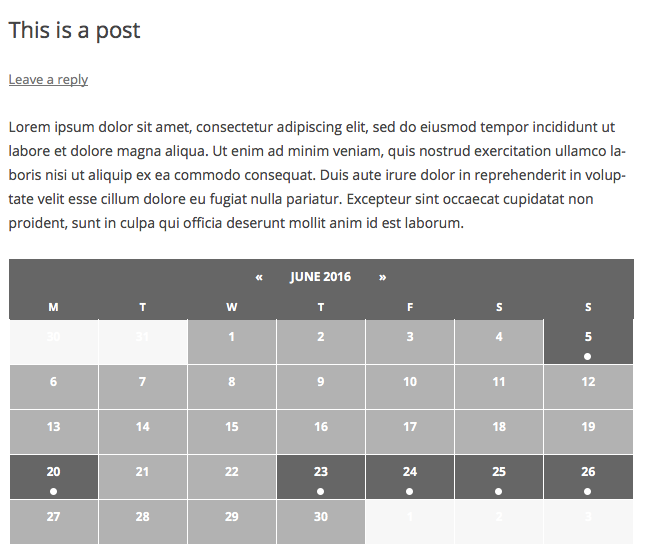 You can insert complete calendar views into any post, page, or other post type that allows for shortcodes to be used. This is possible by using the [tribe_events] shortcode. Head over to the official [tribe_events] shortcode guide to learn how to use it. This mini calendar is generated by a shortcode in post content. You can apply filters in many different ways, in fact. Click here to learn more about all of the [tribe_mini_calendar] shortcode options. Doing this is very easy: you simply head to the event that you want to embed elsewhere; copy its permalink URL; and then paste this URL into the content of the post or page inside of which you want the event to be inserted. An example of an event embedded in post or page content. If you are using a version of WordPress below 4.4, or a version of The Events Calendar below 4.2, then the above embed features will not be supported.